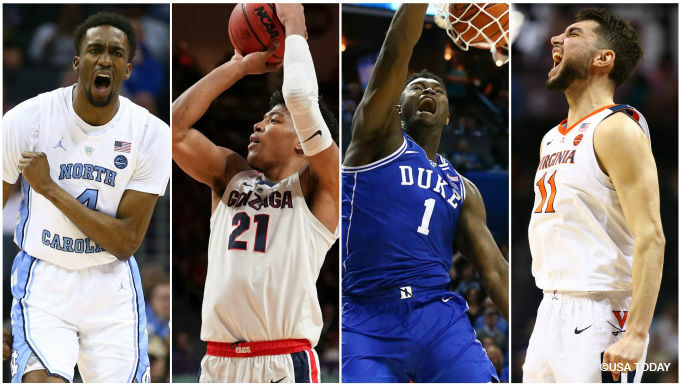 Welcome to your one-stop March Madness betting spot for betting tips on every region in the 2019 NCAA Tournament. Are you going to back a top mid-major to go to the Final Four? Will there be one of the biggest NCAA tournament upsets in history? What are the best value bets? There's plenty here for college basketball betting fans to dig in to, as four of our experts take you around the country. 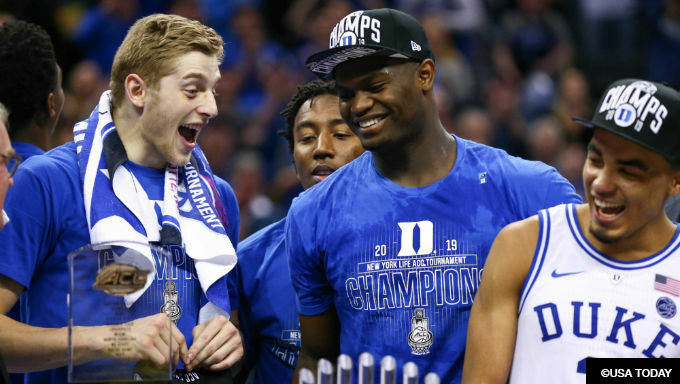 David Caraviello breaks down the East and who might challenge Duke. The last time Duke played in Columbia, S.C., it was hardly a memorable experience: A team that would finish 13-13 split games against LSU and Princeton in December of 1974, well before the Coach K era transformed the program into a national power. How different things will be when the Devils swagger back to the Palmetto State’s capital city as the No. 1 overall seed in the NCAA Tournament. The East Region marks a homecoming for Zion Williamson, who grew up in South Carolina, and the first step for Duke in what seems an inevitable march to the Final Four — barring any further shoe explosions, of course. Can anyone stop them? The Devils, with a healthy Williamson, are overwhelming favorites to reach the Final Four. So, let’s break down the Duke Invitational, which culminates in a regional final in Washington. Yeah, there’s no value there. But Duke looked every bit the best team in America in the ACC tournament, which might prove tougher than what the East Region will present. No. 2 seed Michigan State is a very good team with a great player in Cassius Winston, but Duke has beaten better teams in the ACC. No question, freshmen-laden teams can get rattled in the tournament. These are different freshmen, and this is a different team. Of all the realistic upset possibilities in the East Region, this one offers the best payoff. When we last saw LSU, the Tigers were bowing out of the SEC tournament in their first game. Coach Will Wade remains suspended due to his alleged connection to a corruption scandal. Yale has a core of players who have been to the NCAAs before, a potential NBA draft pick in shooting guard Miye Oni, and an offense that pushes the ball up court. The Louisville that hammered the Tar Heels in the Dean Dome hasn’t been the same since blowing a sure thing against Duke. The Cardinals limp into the tournament having lost five of seven, one of those a terrible defeat to Boston College. The Gophers slipped into the NCAAs after winning four of their last five, two of those upsets of a good Purdue team. Minnesota has a solid point guard, is strong around the basket, and very capable of keeping this close. 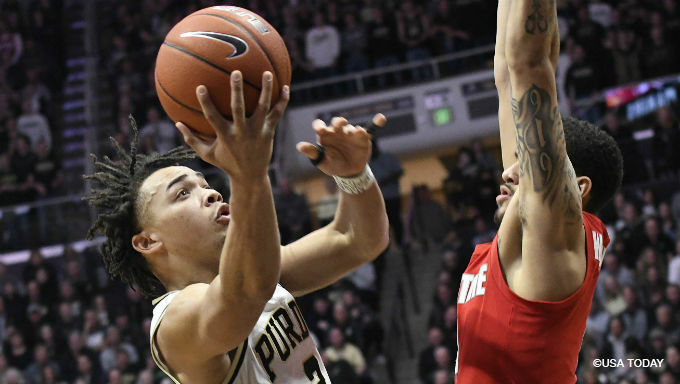 The Terps have been all over the place, scoring nice regular-season victories over Purdue and Wisconsin but getting ousted by Nebraska in the Big Ten tournament. But here’s what Maryland does have: A big man in Bruno Fernando who can match up with Duke’s Williamson inside. A physical presence at 6-10 who thrives on high-percentage shots (much like you-know-who), Fernando should be a high NBA draft pick in his own right. Plus, Duke against Maryland in D.C. would feel like the old ACC days all over again. Pete Pistone breaks down the Midwest and who might challenge North Carolina. The 16 teams that make up this year’s NCAA Tournament Midwest Region represent a wide range of success stories. Led by No. 1 seed North Carolina, the region includes a few more college basketball bluebloods along with some tournament newcomers to cast an interesting light on what should be a competitive scramble to reach the Final Four. UNC is certainly the behemoth, but it may not be a foregone conclusion coach Roy Williams is able to get the Tar Heels out of the region unscathed. The Tar Heels will be making their 49th appearance in the NCAA tournament this year with hopes at earning a seventh national championship. While it won’t be easy, North Carolina remains the solid choice to navigate its way through the bracket. 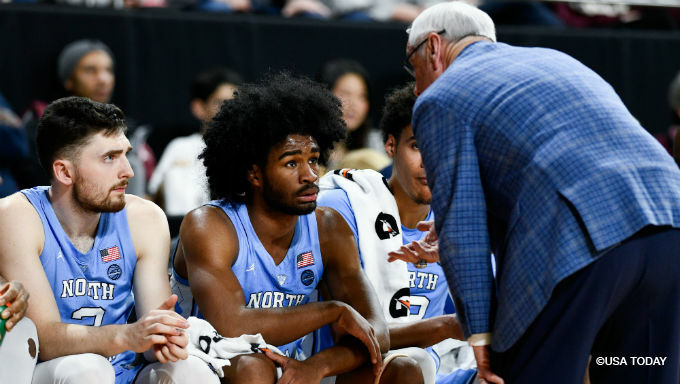 Led by top players Cameron Johnson and Coby White, Carolina brings its usual swagger into the tournament with a team that went 27-6 in the regular season and 16-2 in the ACC. Depth is a strong suit for UNC, and it will need contributions from Luke Maye to complement Johnson and White. The Jayhawks went 25-9 in the regular season and are three-time NCAA tournament winners, with their latest coming in 2008. But Bill Self’s team has had a lot of ups and downs this season including a 10- game winning streak to start the year but then going 15-9 the rest of the way. Leading scorer Dedric Lawson, a transfer from Memphis who sat out last season, averages 19.1 points per game. Several key injuries have depleted the squad, but if Kansas can get a couple of wins to kick things off, they’ll get a big boost with some home cooking as the region finals move to Kansas City. Good thing for the Tigers they were able to get their act together at just the right time and ride a wave of momentum into the tournament. Auburn started 9-1 but then struggled before finally putting together an eight-game winning streak that included an SEC conference championship victory over Tennessee. Bryce Brown and Jared Harper have been red-hot, and that hot shooting should be enough to take down a scrappy New Mexico team in the first round. One of eight Big Ten teams in the tournament, Ohio State was squarely on the bubble heading into the last days of the regular season. But a win over Indiana in the conference tournament secured the spot. The addition to Kaleb Wesson, who had been suspended, made a huge impact on the Buckeyes fortunes. His presence as well as numbers helped propel Ohio State back to more of the team that began the year up as high as No. 14 nationally. Scoring from C.J. Jackson on a regular basis and Luther Muhammed playing close to his regular season numbers (8.0 PPG, 2.8 RPG, 37.2 3FG%) will be hard to stop. Ryan Butler breaks down the South and what promises to be a wild region. Expect the unexpected in a loaded corner of the bracket. The South Region features the defending national champion, two teams that held No. 1 rankings during the regular season and seven different teams that won their respective conference championships. While high-profile squads like Virginia, Tennessee and Villanova may generate most of the headlines, it’s the teams receiving less publicity that should make the most noise in this wide-open region. Competing in arguably the nation’s deepest conference during the regular season, Purdue held its own with a 16-4 Big Ten record, good for second place. Two tough losses to a tournament-bound Minnesota team at the end of the season aside, the Boilermakers have had one of the most impressive runs of any team during the 2018-2019 season. The two teams favored ahead of them, UVA and Tennessee, obviously present major obstacles, but both have major concerns that could prevent deep runs which should keep bettors away. The Badgers also present an impressive body of work, generating a No. 12 KenPom ranking and also feature one of the nation’s best players in Ethan Happ. With a deep, veteran team hungry for a big run after missing last year’s tournament, UW should be a first-round favorite in nearly any matchup. While Oregon is arguably the nation’s hottest team having stormed through four wins in four days in the Pac 12 tournament, the Ducks were still the No. 6 seed in one of the nation’s weakest conferences. If it weren’t for the unexcepted run to the conference title, Oregon wouldn’t sniff the Big Dance field. Expect the miracle streak to end early for the Ducks. Wisconsin is an excellent bet, even at -1. If the line shifts back toward Oregon, the opportunity is even better for bettors. Villanova may have won this tournament twice in the last three years but this year’s squad is far from a title contender. Meanwhile Saint Mary’s is coming off one of the most impressive wins of any team all season by pummeling Gonzaga in the West Coast Conference finals. The Gaels are also the most under-seeded team according to KenPom, garnering a No. 11 seeded despite a No. 31 ranking. Conversely Villanova earned a No. 6 seed with a No. 26 ranking. This means the Wildcats are ripe for an upset. While it’s hard to pick against ‘Nova and head coach Jay Wright, especially in the first round, getting 5.5 points for Saint Mary’s is too much to pass up. Like Saint Mary’s, Cincinnati is coming off one of the season’s most impressive wins. By topping Houston in the AAC conference finals, the Bearcats proved they can contend with any team in the nation. One of four tournament teams from the AAC, Cincy is used to a grinding schedule. A first-round matchup with Iowa is challenging, as is a potential second-round match up with the Vols, but the well-rounded, veteran team should be able to more than hold its own. While no one will put UC as a favorite, it is nevertheless an intriguing longshot to reach the Final Four. Jordan Bianchi breaks down a very competitive West bracket. If there is an air of familiarity with the West bracket it is with good reason. Just as they were a year ago, Gonzaga, Michigan and Florida State are again three of the top-four seeds in this region. Last year, the Bulldogs, Wolverines and Seminoles each advanced to West region semifinals. And there stands a reasonable chance each team will repeat their 2018 tournament performance in 2019. Even though Gonzaga has the second-best odds (+575) to win the national championship, trailing only Duke (+220), expectations have cooled for the Bulldogs. That comes following a shocking loss to St. Mary’s in the West Coast Conference tournament championship game where Gonzaga’s usually stellar offense scored just 47 points. But ignore the lackluster performance versus St. Mary’s. 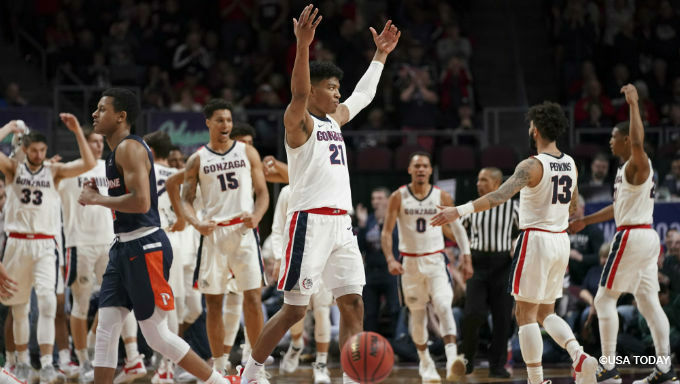 Instead, focus on the fact Gonzaga went 30-3 this season, is one of only two teams to beat a fully healthy Duke squad, and features a pair of potential All-Americans in Rui Hachimura and Brandon Clarke. Sometimes the best bet is the most straightforward. Texas Tech was a No. 3 seed last year and advanced to the Elite Eight, losing to eventual national champion Villanova. The Red Raiders followed that run by sharing the Big 12 Conference regular season title (snapping Kansas’ 14-year stranglehold) and again earning a three seed in the NCAA tournament. And yet, despite its accomplishments and possessing one of the best defenses in the country, Texas Tech finds itself not widely considered as a team capable of making the Final Four. But if you’re seeking value, the Red Raiders are your team -- especially in region that has the potential to be blown wide-open. No. 12 Murray State upsetting No. 5 Marquette is going to be a popular pick in many pools, so finding a reasonable line may be difficult. Nonetheless, the Racers are still the best bet to pull off a first-round an upset. Murray State is led by likely NBA lottery pick point guard Ja Morant, averaging 24.6 points and 10 assists per game this season, and facing a Marquette team that has limped into the tournament with four losses in its past five games. Playing the role of Cinderella is something Buffalo is quite familiar with, having upset No. 4 Arizona (89-68) as a No. 13 seed last year. The Bulls, led by Mid-America Conference player of the year CJ Massinburg (18.3 PPG, 6.6 RPG), return to the tournament this time as a sixth seed to take on the winner of the Arizona State-St. John’s play-in game. No matter which team Buffalo gets in Round 1 it will be the favorite and the Bulls have the team to go on a deep run --even if they’re matched up against Texas Tech in the second round.